Several of my quilting friends and I are going on a quilt fabric shop hop entitled “Bop around the Bay,” where the participating shops are all near Grand Traverse Bay. 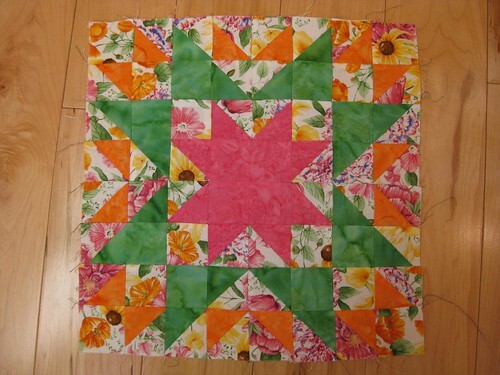 The shop hop is sponsoring a contest to make the best 12 inch block using the floral print seen in my creation here. All the blocks will be given to charities once the winner has been chosen. Very pretty…your work is just so perfect and creative! I admire your skill! Thanks, Heather. Nice to know someone is reading my blog!